1. Carefully place the massage pads across the targeted area such as your low/mid and/or upper back. 2. Apply to multiple areas simultaneously using four pads, or use 6 pads with the optional dual connector. 3. Place pads vertically when pain extends across a significant distance of your back. 1. We recommend a therapy such as SWEDISH and set the duration to at least 10 MINUTES. 2. Another great therapy for back pain is REFLEXOLOGY and set the DURATION to 20 or 30 MINUTES. 3. If you are looking to facilitate or improve a group of muscles, use therapy REFLEXOLOGY or GUA SHA. Set the DURATION to at least 10 MINUTES and increase the INTENSITY to as high as you can tolerate. SUGGESTED ACCESSORY: The e-Pulse® Workout Belt has been specifically designed for the lower back and abdominal muscles. 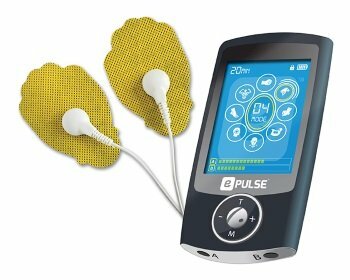 For large muscle groups, we also suggest using the e-Pulse® Massage Brace (both sold separately or in bundles). 1. Carefully place the massage pads on either side or across the targeted area such as your ankle, across the length of your shin, around your calf, knee, hamstring, or across your thigh. 3. Place pads vertically when pain extends across a significant distance of your legs or in either side when applying to a smaller area. 1. We recommend a therapy such as SWEDISH for a minimum of 10 MINUTES. 2. Another great therapy for leg pain is KNEADING, and set the DURATION to 20 or 30 MINUTES. 3. If you are looking to facilitate or improve a group of muscles, use EMS therapy REFLEXOLOGY or GUA SHA. Set the DURATION to at least 10 MINUTES and increase the INTENSITY to as high as you can tolerate. SUGGESTED ACCESSORY: For large muscle groups, we suggest using the e-Pulse® Massage Brace (sold separately). For lower leg or foot pain, the e-Pulse® Massage Shoes and Massage Socks are an excellent alternative (both sold separately). (Warning: We recommend using small pads for effective results. 1. Carefully place two massage pads across the targeted area of your neck. 2. Place pads vertically when pain extends across a significant distance between your neck and shoulder. 3. Avoid placing pads too close to your head or near the esophagus or windpipe. 1. We recommend a therapy such as LOMI LOMI and set the DURATION to 20 or 30 MINUTES. 2. Another great therapy is ASSORTED and set the DURATION to 20 or 30 MINUTES. SUGGESTED ACCESSORY: For neck pain, we suggest you use small massage pads which are ideal for smaller muscle groups. 1. Carefully place two massage pads horizontally across the area of your trapezoids. 2. Place pads in a parallel position for rotator cuff ailments. 1. We recommend a therapy such as KNEADING and set the DURATION to 10 MINUTES. 2. Another great therapy for shoulder pain is CHOPPING and set the DURATION to 20 or 30 MINUTES. 3. If you are looking to facilitate or improve a group of, we recommend A therapy such as TRIGGER POINT or REFLEXOLOGY. Set the DURATION to at least 10 MINUTES and increase the INTENSITY to as high as you can tolerate. 1. Carefully place the massage pads on either side or across the length of your forearm, around your elbow, or across your bicep and/or triceps. 3. Place pads vertically when pain extends across a significant distance of your arms or on either side when applying to a smaller area.